Susan and Patrick King are available for speaking engagements, either together or separately. 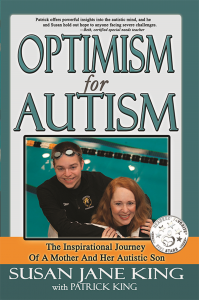 Susan King has worked for 21 years with her son Patrick, cultivating an optimistic approach to his autistic challenges. Co-founder of Covenant Ministries and teacher of a large Sunday School class, Susan is a published writer, Bible teacher, and experienced speaker who helps persons facing ongoing challenges to find joy in the journey. Patrick King attends Pfeiffer University, where he serves on a newly created Autism Center Committee. He is an accomplished vocalist, scholarship athlete, and Presidential Scholar. He finds joy in helping others understand about autism and the constant hope found in the Lord. Anxieties, Fears, and Meltdowns . . . Oh My! Thank You Teachers, Therapists, and Other Friends! Susan and Patrick will be glad to try to accommodate you if you have a particular topic or theme in mind for your event.